I wouldn’t have believed it if I hadn’t seen and tasted it myself. Two highly talented chefs – Anthony Sinsay, executive chef of Harney Sushi in San Diego, and Katsuya Fukushima, executive chef of José Andrés Catering with Ridgewell’s in Washington, D.C., transformed foods such as canned creamed corn, canned chipotles and canned truffles into some of the most inventive and mouth-pleasing dishes I’ve tried in a while. Seriously! 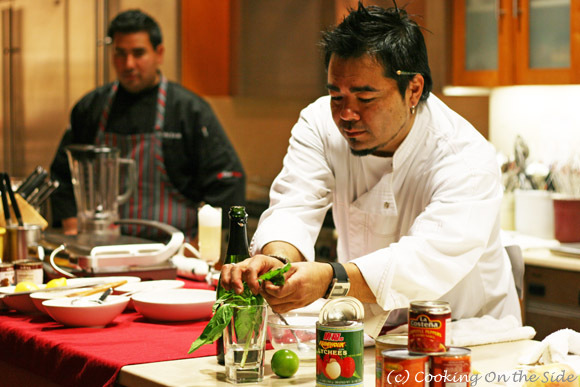 It was a class they taught in conjunction with the 7th Annual San Diego Bay Wine & Food Festival last month. Of the six creative dishes they demonstrated, my two favorites were Chef Fukushima’s floral, margarita-like Lychee Champagne Martini, made with canned lychee in syrup and canned lecithin, and Chef Sinsay’s Crab & Corn, with canned crab meat, a silky creamed corn panna cotta and a sweet-hot vinaigrette made with orange marmalade and canned jalapeños. These guys really seized the challenge – it was a real treat to watch them in action and, of course, partake of their creations! 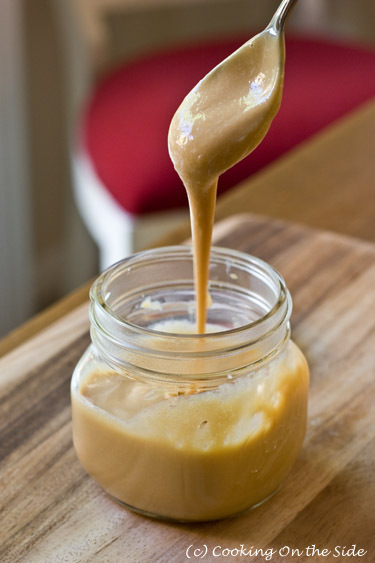 You don’t have to use canned milk to make Dulce de Leche, but it’s definitely the common way to do it. It makes it incredibly easy to make this wonderfully sweet milk caramel. Some people make dulce de leche by simply boiling the sweetened condensed milk right in the can, but this method seems a bit scary to me (I don’t need exploding cans in my kitchen!). I much prefer the safer approaches suggested inside the can wrapper. The oven method I used involved just baking the milk in a dish with a water bath for an hour. It came out of the oven golden brown, creamy, caramelized and positively addictive. I love to spoon dulce de leche over ice cream, of course, but this time around I decided to swirl some into brownies (see the Dulce de Leche Brownies recipe at DavidLebovitz.com). I brought these brownies to a Latin-themed potluck and the tray was cleared out before my husband got a chance to try one! Stovetop: Pour milk into top of double-boiler pan; cover. Place over boiling water. Cook over low heat, stirring occasionally, for 40 to 50 minutes, or until thick and light caramel-colored. Remove from heat. Beat until smooth. Oven: Preheat oven to 425°F. Pour milk into a 9-inch pie plate. Cover with aluminum foil; place in shallow pan (pan should be larger than pie plate). Fill pan with hot water. Bake for 50 to 60 minutes, or until thick and light caramel-colored. Pour milk into small mixer bowl; beat until smooth. Microwave: Pour milk into large microwave-safe bowl. Cook on Medium (50%) power for 4 minutes, stirring halfway through heating time. Reduce power to Medium-Low (30%) power; cook for 8 to 12 minutes, stirring with a wire whisk every few minutes, until thick and light caramel-colored. NOTE: Microwave ovens may vary; adjust timing accordingly. I love your blog!! Thank you for sharing this one I will make those brownies for work :)! Happy Holidays to you! Thanks, Monica! Your coworkers will love those brownies, they’re amazing. Happy Holidays to you too! Oh wow! The brownies look amazing. No wonder they disappeared quickly. I will have to try these soon. Hope your doing well Kathy! Happy Holidays to you and your family. This is such a creative approach to a recipe collection. I always ignore included recipes too, but you’ve inspired me to take a closer look! I just made dulce de leche in my slow cooker. A lot less worry of the exploding can. Put a not so favorite plate in the bottom of your slow cooker (the can rusts) – the plate will have a permanent rust stain. Fill slow cooker with water until can is completely covered. Put lid on slow cooker. Cook on low for 8 hours. Turn off slow cooker and let can cool in the water. I love new ways to use my slow cooker! But does the rust get into the milk? I’ll have to try the oven method (or even the crockpot method above)! I’ve done it on the stove with the sealed can several times with no accidents yet. I think the trick is to make sure that the cans are completely submerged in water the entire time. 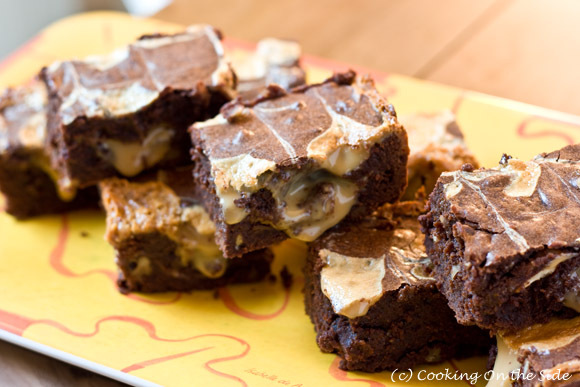 I’ve been meaning to make those brownies for a while now…maybe I’ll have to make them for Christmas! Such a great tip! Can’t wait to try this, Kathy. Terrific – I hope all goes well, Lizzie! Making this in the oven – so far it’s been in there 90 minutes and still looks and tastes like sweetened condensed milk – only got a tiny bit brown. Am I doing something wrong? I didn’t have a pie pan that fit inside my 9×13 so I used a smaller pyrex inside of a larger one. All I can think of is perhaps your oven isn’t hot enough? Have you ever tested it with an oven thermometer? My oven always beeps to say it’s preheated, but according to my oven thermometer it’s not actually up to temperature for another 20 minutes or so. Next post: Congrats to the Windows Phone 7 Winner!